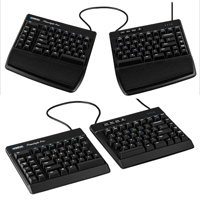 The Kinesis Freestyle Pro Keyboard is a 95 key keyboard that is divided into two separate halves connected by a cable. The keyboard uses Cherry MX Brown mechanical key switches. Optional accessory kits can be purchased for additional Freestyle Pro keyboard configurations. Without an optional accessory, the Freestyle Pro allows splaying and separation of the two keyboard halves. If you require palm supports or tenting (vertical adjustment) see the Optional Accessories below. Without accessories, the keyboard is 15.5"W x 7.25"D x 1.25"H.
VIP3 Pro Accessory Kit: allows the user to create adjustable lateral sloping or tenting of the keyboard modules at 5°, 10° or 15°. Palm supports are included with this kit and must be in place in order to use the tenting mechanism. V3 Pro Accessory: offers tenting of 5°, 10° and 15°. Note: it is not possible to use palm supports with the V3 Pro. Click here for more images and pdfs. Premium Cherry MX Brown Mechanical Key Switches: The Freestyle Pro Keyboard is equipped with Cherry Brown MX mechanical switches that offer a 45 gram tactile activation with audible click. Pre-Programmed Layouts for Plug-and-Play Functionality: The Freestyle Pro Keyboard comes pre-programmed for the Standard QWERTY layout as well as two secondary layers programmed for immediate access to Mac and Dvorak layouts. Fully Programmable: The Freestyle Pro Keyboard can be fully reprogrammed for custom applications. The on-board memory is capable of storing 9 dual-layer (95 keys per layer) fully programmed layouts (effectively 18 custom layers). Programming Cluster and Indicators: The 4-key programming cluster is located at the top of the right hand keyboard module. The LAYOUT key provides quick access to the 3 primary layouts (1, 2, and 3), the MACRO key controls the on-the-fly Macro recording, and the REMAP key controls the onboard remapping. The 4th key is the SMARTSET key which controls all onboard programming shortcuts. The accompanying LEDs advise which primary layout is currently active, whether Macro programming is active (flashing), and whether Key Remapping is in progress. The SmartSet LED flashes to confirm specific programming commands. On-The-Fly Remapping: Key remapping is available directly from the keyboard and requires just 3 keystrokes (Remap Key, Source Key, Destination Key). All keys are remappable, even between the dual layers. Driverless HotKeys: A convenient set of 8 pre-programmed HotKeys are positioned on the left side of the left hand module. Conveniently located for quick access these keys offer one-touch access to common editing and navigation functions. Onboard Multimedia Controls: The F1 - F6 keys provide Fn key access to full multimedia controls. All of these available functions can also be reassigned to any key using the Onboard Programming or the SmartSet App for Windows. Multi OS Programming: The Freestyle Pro Keyboard supports Windows, Mac OS X and Linux. Programming can easily be performed as Onboard Programming in all OS or Direct Programming - also in all OS. Windows and Mac users have the added option of using the SmartSet Programming App. On-Board SmartSet Programming Engine: The Freestyle Pro Keyboard features a 4 MB on-board v-drive that retains all custom programming. The SmartSet Programming Engine is always available because it is permanently stored on the v-drive. This eliminates the need of installing programming software to the computer. Rather, the software travels wherever the keyboard goes. SmartSet APP Programming: This feature-loaded graphical interface App for Windows (pre-loaded) and Mac (downloadable) offers all the functions of the SmartSet Programming Engine with additional functionality for power users. Macro Recording: Each layout can store up to 24 macros and each macro can be up to 300 characters long. Macros can be assigned to trigger by a single key or by a 2-key combination. Special Actions Option: There is a menu of non-standard "Special Actions" available for programming. These can be programmed either directly or through the SmartSet App. Full NKRO: The Freestyle Pro is equipped for FULL NKRO (n-key rollover) which is easily activated via the onboard shortcut. Once activated the NKRO mode remains active until the onboard v-drive is opened or the keyboard is unplugged. Variable Speed Macro Playback: Macro playback of text and key action macros is speed adjustable via the Macro shortcut, with 9 speed levels available. These speed settings range from 4 APS (actions per second) and 48 words per WPM (words per minute) up to an amazing 250 APS and 3,000 WPM. The keyboard default is a reasonable 35 APM and 420 WPM. The SmartSet App or Direct Programming support the application of custom speeds to any of the nine available settings. It is also possible to temporarily disable all macro playback without losing macro data. Convenient STATUS Report Shortcut: The Freestyle Pro features an onboard shortcut for viewing a quick keyboard Status Report in any text-editing program. RESET Options: Two methods of RESET are available. A SOFT Reset will erase all custom remaps and macros in both layers of the active layout. A HARD Reset will erase all nine layouts and reset the Freestyle Pro Keyboard to the factory default settings. To ensure that soft resets are not activated unintentionally this shortcut requires a unique 3-key combination. Activation of a Hard reset requires that a 2-key shortcut be performed while plugging the keyboard in, also ensuring that completion of a hard reset is an intentional action. Familiar Key Layout: Standard TenKeyLess layout means minimal adaptation time for experienced typists. Variable Separation: The two modules of the Freestyle Pro Keyboard can be separated up to 20" apart, a range which is ample for the majority of users. The length of the joining cable is adjustable, with a convenient compartment in the left module for storage of the excess cable.